Get ready to fire up the fat-burning engines and commit to your weight loss goals! Dieting can leave you feeling tired and grumpy, making it hard to stay motivated on your weight loss journey. That's why we decided to create IdealBurn! 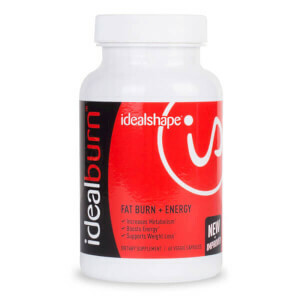 IdealBurn combines two powerful blends of ingredients for a powerful fat-burning supplement to help support your weight loss. Our Thermo Oxidation Blend Promotes healthy metabolism and fat oxidation while the Neuro Energy Blend helps you feel energized. IdealBurn can be especially effective when you complement it with The IdealPlan. Need a good jumpstart to your weight loss journey? Start with IdealBurn! Suggested Use: Take one (1) IdealBurn capsule with 16oz of water at least 30 minutes before breakfast for one week. After one week, add another capsule at least 2 hours before lunch with 16oz of water. Do not exceed two (2) capsules a day. After 7 consecutive weeks of using (2) capsules per day, completely stop using IdealBurn for one week to re-sensitize your body to this powerful supplement. Then start the cycle again. Feeling good and feeling energized goes a long way toward success on a weight loss plan! You need energy to stay motivated and on top of your goals. You also need energy to feel ready to hit the gym and stick to your weight loss plan. IdealBurn's Neuro Energy Blend contains L-Tyrosine, Natural Caffeine, Huperzine A Extract, and Bioperine. Heat up your results with a powerful combination of fat burning ingredients. IdealBurn’s Thermo Oxidation Blend contains Green Tea Leaf Extract, Cayenne Pepper Fruit Extract, Thermodiamine™ and Purple Tea with GHG™. These ingredients help to support your metabolism. IdealBurn contains green tea and caffeine. Caffeine anhydrous to help you feel energized and ready to tackle your weight loss goals.